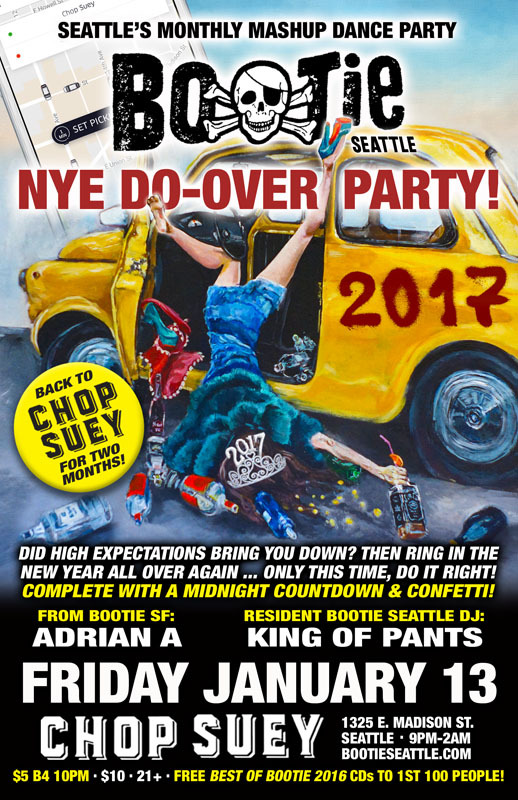 Seattle Bootie Seattle @ Chop Suey — NYE Do-Over Party! NEW YEAR’S EVE DO-OVER PARTY! Then come out to Bootie and ring in the New Year all over again … only this time, do it right! Complete with another midnight countdown & tons of confetti! FREE “Best of Bootie 2016” CDs to the first 100 people! It’s Bootie Seattle’s NYE Do-Over Party, where you get a second chance to ring in the New Year right! No more ending up at the wrong party kissing the wrong person — we’re hitting the reset button on 2017 so you can ring in the New Year all over again! We’re even going to have another midnight countdown, and tons of confetti! Bootie returns to our original Seattle home, Chop Suey, for two months, with Bootie co-founder Adrian A coming up from San Francisco to join Bootie Seattle resident DJs King of Pants and Destrukt, as they all make sure your year gets started over right, spinning only the greatest mashups, including the best from the past year! Guaranteed to get you dancing, they’ll reset your year so you can get a fresh start! Plus FREE “Best of Bootie 2016” CDs for the first 100 people through the door!